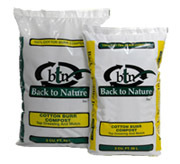 How does bulk quantity compare to bagged? 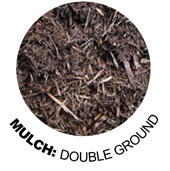 1 scoop of bulk mulch is roughly equal to six and a half 2 cubic foot bags of mulch. Do I have to call ahead to buy bulk products? How much mulch will fit in my truck? How much is one scoop of mulch? One scoop is approximately equivalent to one-half of one cubic yard. Use the calculator to estimate the amount you need for your area. What if I want my mulch delivered? Call or come in and we’ll put you on the schedule! Our dump truck will carry up to 20 scoops of mulch, and delivery ranges from $30 within 5 miles of the nursery to $50 within 20 miles. 21-40 miles is $100. There is no minimum! Many types of material, organic and inorganic, may be used as mulch. Organic mulches may break down in one season or less or persist for more than one season. The first type is used mainly in vegetable and flower gardens or around newly planted trees and shrubs. They are usually decomposed enough by the end of the growing season that they can be spaded or plowed under, increasing the organic matter content of the soil and thereby improving soil structure. Vinland Valley Nursery recommends the double ground hardwood mulch for this purpose. Organic mulches that persist for more than one growing season are more useful around permanent plants. Vinland Valley Nursery recommends the single ground hardwood mulch for this use. Inorganic mulches may be gravel, crushed stone or some manufactured product. Most of these materials are not as beneficial to plants as the organic mulches because they don’t improve the structure or nutrient content of the soil, and can also create hot spots that literally cook plants during hot weather. Rock mulch is best used where plant material is limited or not used. Spun-bonded or woven landscape fabrics (geo-textiles) should be installed under gravel mulches to prevent weeds and allow for easier removal when needed. Vinland Valley Nursery does not recommend landscape fabrics for use in plant beds. Though not generally considered mulches, some low-growing ground cover plants produce many of the same benefits as mulch (click here for a list). They shade the soil surface, keeping it cool in summer and at the same time preventing evaporation. Vinland Valley Nursery can recommend good plants for your specific site. Double ground hardwood mulch has bark added. Chunks are smaller, and the overall appearance of the mulch is darker. This mulch will break down faster than the single ground, and is a good choice for areas where you’re trying to build the soil quality. 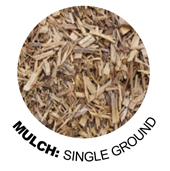 Single ground mulch is primarily oak with a mix of various other hardwoods. Chunks are larger, and the appearance is a light brown which ages to a gray over time. Mulches provide many benefits to plants. Benefits vary with the material used, the type of soil, the kind of plant and the cultural practices used. Mulches also may be used to make landscapes more attractive and usable and to reduce the amount of maintenance work. 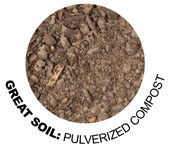 Locally produced compost is clean and finely ground. When creating new raised beds or filling, we recommend using half topsoil and half compost. We can load compost in your truck, or deliver it. Same amounts apply as for topsoil. 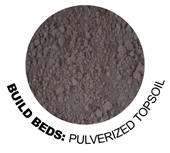 Vinland Valley Nursery offers top quality pulverized topsoil in bulk. We can load it in your truck or deliver up to 8 scoops at a time in our dump truck. Topsoil is very heavy! Small pick ups can hold one scoop, while most 1 ton pick ups can hold two.